Currently we are working hard recording our new CD of film themed music. Please contact us to pre-order a copy. 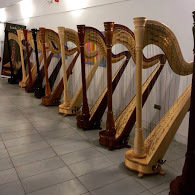 We regularly run fun filled day for harpists of all levels to get together and enjoy playing with one another, with a concert at the end of the day. Do contact us for details of the next one. All ages, levels and abilities welcome! Harpe Noire is the sparkling duet of Liz Grier and Emma Graham. Both harpists are accomplished musicians and have been playing the harp for many years - maybe too many to count! We are delighted to be working together. 2012 was our first year of working together and since then we have worked together in a range of roles, from concerts to wedding fairs, charity fundraisers to harp workshops in schools. Please feel free to contact either of us for more details on our forthcoming engagements as Harpe Noire, or how you could book us to make your events extra special! Or we have a range of CDs available. “Harpe Noire Live” is a live recording of a recent concert in Exeter. “Harpe Noire at Christmas” is a selection of Christmas music, both traditional and modern. Both are only £5 + postage. Just email me and I’d be delighted to post them to you.